The entrance into the two harbors at Man O' War is very narrow and shallow, but the shallow areas are easy to spot in good light. Our first inclination was to turn right once inside and try to find a spot to anchor in Eastern Harbour. We idled around for a while, but quickly found that the harbor was full of moorings, and where the mooring didn't show, the large concrete blocks were still on the bottom just waiting to foul an anchor. 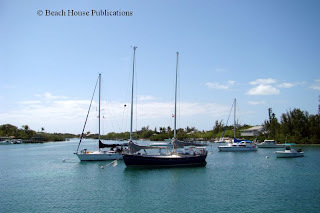 A nice gentleman dinghied up to us and offered us one of his moorings, but a large steel sailboat had anchor so near it that we could not fit in between the mooring ball and the anchored boats. After motoring around a bit and determining that there was indeed no place to safely anchor, we headed into the Northern Harbor just off the settlement. This, too, was filled with moorings, so we reluctantly gave up and picked up a mooring ball. The first mooring we picked up didn't give us a lot of comfort since it put us very close to another boat, so we moved to another nearby that offered more swinging room. 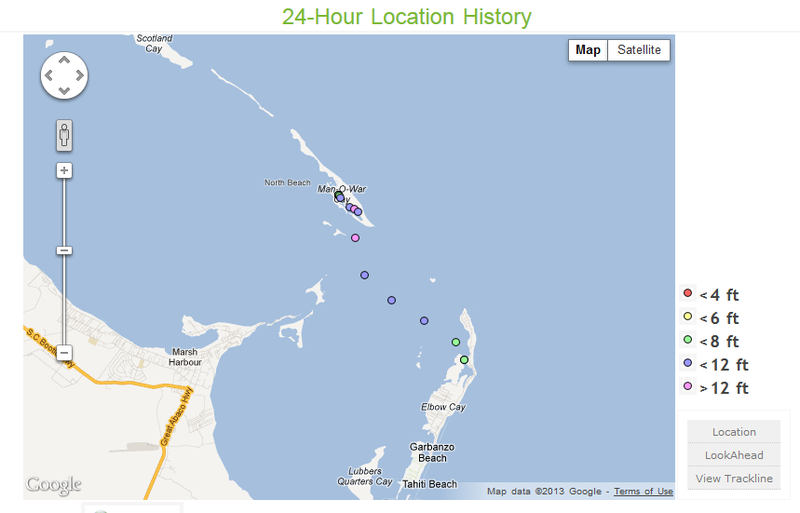 We really love the short distances between new locations. Man O' war is probably most famous for the Albury family boat-building business. The island was originally settled by British Loyalists from the Colonies and they were talented ship builders. That tradition remains today, but instead of wood ships, the Albury family builds some very fine fiberglass runabouts. Their manufacturing facilities are open to public viewing when a boat is under construction. Man O' War is another very picturesque settlement with well cared for homes and streets lined with all types of flora and fauna. 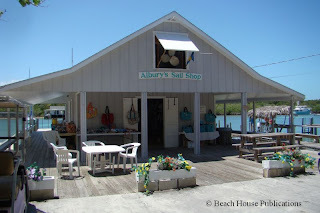 There are some unique shops in town and one in particular is the Sail Shop that makes all sorts of bags and gifts from marine canvas material. There is only one restaurant in town, The Dock and Dine, 2 grocery stores, Joe's Studio (a very nice gift shop), a bakery and, of course, an ice cream store just outside the marina entrance, Island Treats. Albury Brothers and Edwin's Boatyard offer marine services and there is a 60-ton railway for boats that need to be hauled. There are two banks here, one open on Thursday and the other open on Friday. 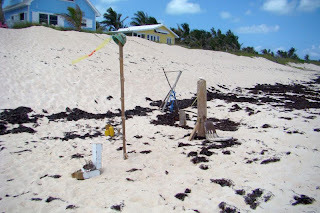 You can walk the entire town in about an hour and cross over the cay to the Atlantic side to visit the beach. On the Atlantic side is a very extensive reef system that runs the entire length of the cay. There are cuts at the north and south ends, but the south cut is recommended only with local knowledge or a guide. We have been absolutely amazed at the number of folks that drop by the boat to say hello and mention that they read this blog. It's always great for Susan and I to meet our readers in person, and it feels good to know the blog is appreciated. Even better, it opens up opportunities for us to meet new boaters and make new friends. 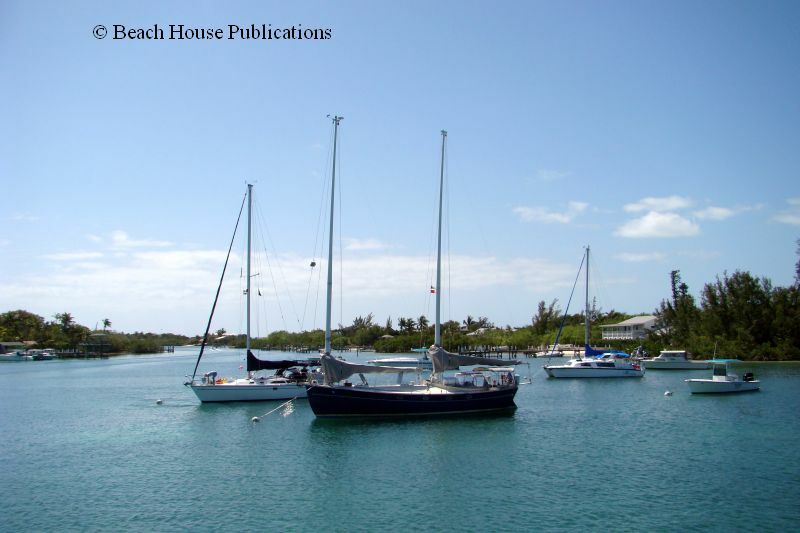 We had 3 dinghies stop by in the at Man O' War, several at Marsh Harbour and more in Hope Town. We also met lots of great folks that have never seen our blog. 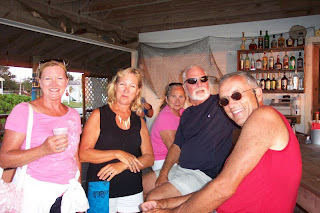 That's the best thing about cruising on a boat, no matter where we go - meeting people. Our next port of call will be Treasure Cay. We enjoyed Man O' War, but it's a small settlement with not a lot to do except rest and relax, and that isn't all that bad. It was well worth the visit and we recommend anyone coming this way to stop for a while. With our schedule and the clock ticking, we want to cover as much of the Abacos as we can without rushing through and missing some great spots.